"There are many people who criticize me every day -- just let them. 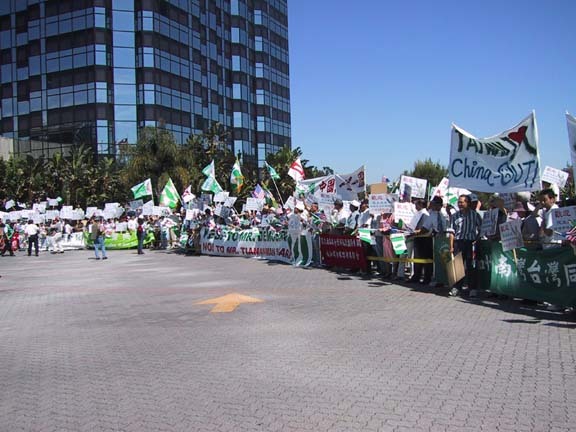 I've given my heart to the nation," Lee Teng-hui told a banquet hall of enthusiastic supporters in Los Angeles yesterday. 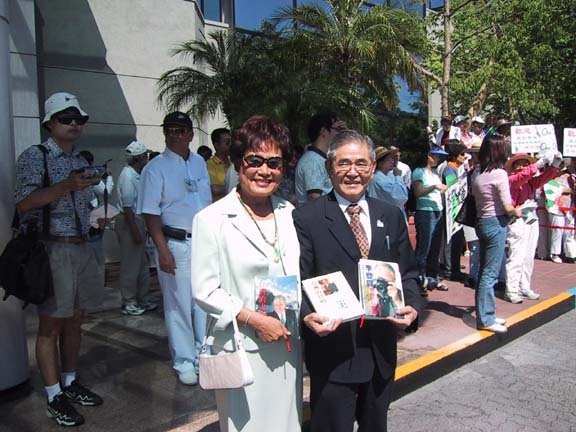 "Taiwan's freedom and democracy can never be forsaken." 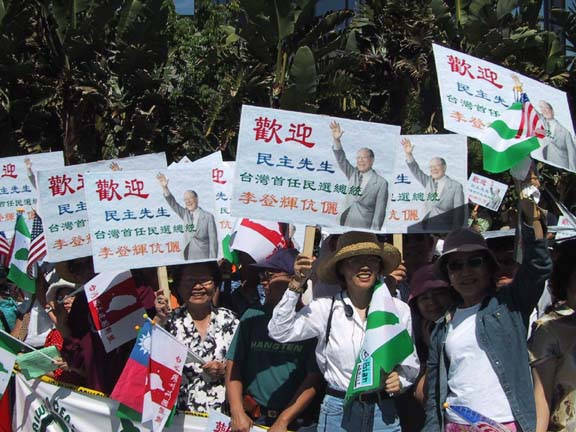 Lee urged the roughly 1,700 overseas Taiwanese in attendance to rally behind Chen so that Taiwan can continue to prosper. 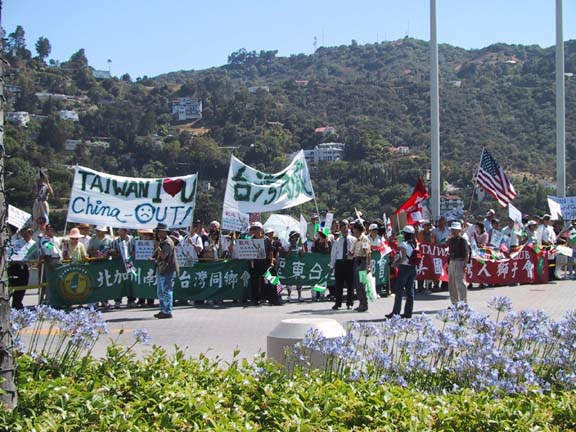 "Taiwan is going through a transition in its economic and political development. We should give [Chen] some time. You can't ask an inexperienced child to run before he learns to walk," Lee said. 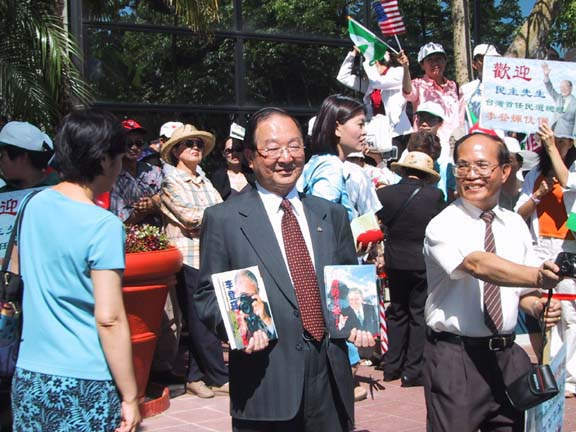 "Someone who was defeated [in the presidential election] has been holding Chen back. Let's all advise Chen on what to do instead of dragging him down," Lee added. 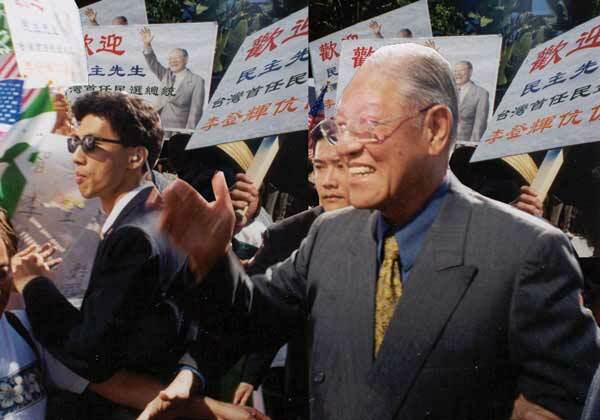 The former president also criticized the KMT-controlled legislature for failing to pass laws that would facilitate the DPP government's rule. Though Lee had told reporters a day earlier that he is in retirement and had no plans to form a new political group, he suggested in his speech yesterday that he may be ready to get back into national politics. "As long as Taiwan's economic downturn continues, I won't retire," he said excitedly. Many suspect that Lee plans to encourage his loyalists to leave the party ahead of the legislative elections in December and form a coalition with members of the DPP. Such a move could devastate the KMT. 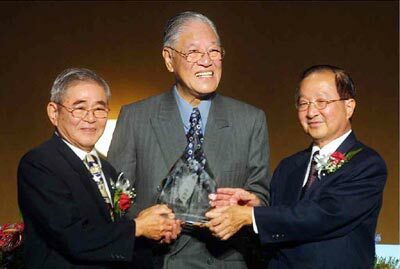 Lee called on asked attendants of yesterday's banquet to find opportunities to invest in Taiwan, but qualified his remarks by saying he spoke as a civilian and not on behalf of the government. Lee's speech was punctuated with enthusiastic applause from the audience, who gave him a standing ovation and shouted "Go forward, Taiwan and Lee Teng-hui!" 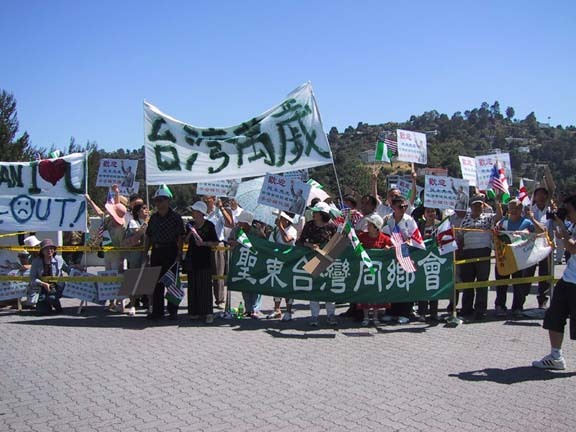 They then sang a Taiwanese folk song: We can win only if we fight. 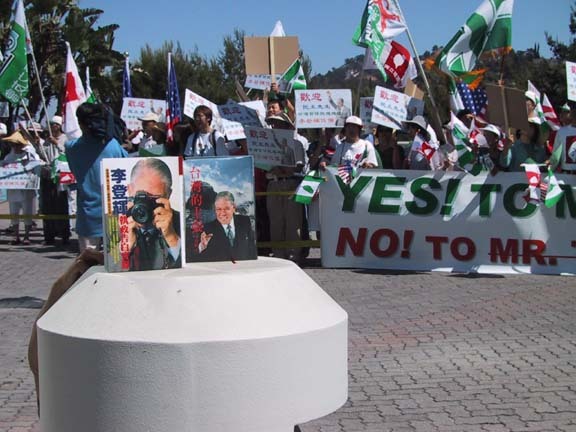 A few dozen protesters waited for him outside the banquet venue, waving signs showing support for a unified China and accusing Lee of corruption. ``Go home Lee,'' the crowd chanted. Before yesterday's banquet, Lee and his wife Tseng Wen-hui toured former US president Ronald Reagan's library in the morning on the first leg of his 10-day visit to the US. They travel to Cornell University in New York today. Meanwhile, controversy over a much-rumored political group backed by Lee continues to draw concern within the DPP. The party's chairman and mayor of Kaohsiung, Frank Hsieh , had a private luncheon with Chen yesterday to discuss possible developments. However, Hsieh later refused to reveal any details of their meeting, saying only that "the party will adopt an electoral strategy of joint campaigning." 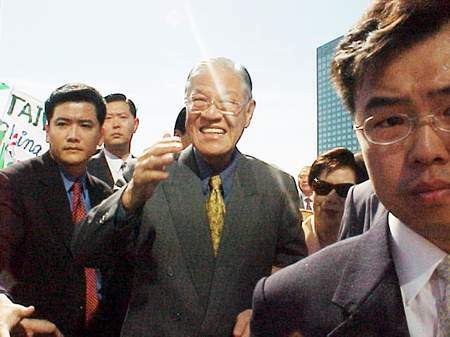 Senior Advisor to the President Yao Chia-wen , who attended the meeting, told the Taipei Times yesterday that "both Chen and Hsieh supported Lee's proposal [to form a new political group] at the luncheon," refusing to elaborate any further. Yesterday however, DPP Secretary General Wu Nai-jen , continued to express his concern that the rumored pro-Lee coalition has not yet mapped out an electoral strategy that would prevent it from encroaching on the DPP's support base.